I have just guzzled down one of these Fennel Frond and Pineapple Smoothies whilst listening to Vance Joy in a nice quiet (and tidy) house, and I feel like I am in my own little personal version of paradise right now. I know, fennel isn’t the first green you think to add to your morning smoothie, but you should. Have you seen the amount of fronds coming off of those plants? They are just begging to be collected up and squeezed into a smoothie. They are basically free produce people, because let’s face it – about 90% of us have just been throwing those fronds out along with carrot tops and beet leaves (don’t throw those amazing greens in the bin!!). If you think you can’t handle that anise flavor in a sweet drink, don’t worry, the pineapple in this smoothie balances it out perfectly. Of course you can still taste it, but it is more of a surprising little aftertaste that makes you go ‘oooh‘, and just takes the smoothie to a whole other level. 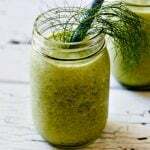 For this Fennel Frond and Pineapple Smoothie I used about a cup of loosely packed fennel fronds (be sure to use just the fronds and not the stalks as the flavor is a lot more mellow). You can use more or less depending on how much you fancy the anise flavor. I am partial to it but the hubby isn’t, so I don’t make mine too strong. Let me know what you think! 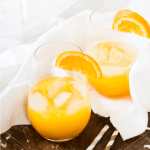 I love to hear from you, so be sure to leave a comment if you give these delightfully refreshing smoothies a try. Happy drinking. Fennel fronds and sweet pineapple chunks star in this delicious smoothie recipe with a twist. Pop all of the ingredients into a high powered blender in the order listed. Blend until smooth and creamy. Donna this sounds amazing. totally down to making this smoothie in the mornings such a perfect way to get a different type of greens into your system. so loving this! thanks for the awesome recipe. Oh you are so welcome!! I hope you love it as much as we do, the flavor is seriously awesome!! This idea is fascinating to me! I love the idea of using the fennel fronds in this, as I have never thought of using that part of the fennel, and not in a smoothie! It sounds like a tasty combo, and one I can’t wait to try! Ive never thought to use just the fronds for a mellower flavor. Usually fennel is so in your face bold that I hesitate to use it in recipes. I happened to have everything to make this and wow…. it was really great. And the fact I got my uber unhealthy eating husband to drink one… well that was just icing on the cake! THANKS for that great tip…. and know we’ll be living on these for breakfast the next few weeks we enjoyed it so! Oh yay, I am so glad you guys enjoyed it!! Your husband sounds like mine, he is always so hesitant to try something new (especially if it is green and healthy), and this smoothie was no different, but he really enjoyed it 🙂 I am the same when it comes to using fennel normally though, I can only use it in a very select few recipes because of the bold flavor. 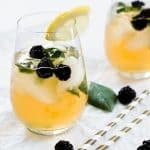 Make this for me and I’ll let you know if it tastes like a fancy cocktail- I may or may not have just polished one off 😉 This makes me wish really hard that I’d planted fennel in my garden!!! I’m going to look for it with the fronds in the store though- this sounds like a delicious breakfast! !